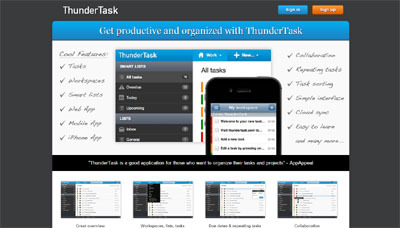 ThunderTask is a simple task management tool to make you more productive and organized. Unlike other todo list managers, ThunderTask is super easy to use. The app is in continuous, user-driven development and aims to maximize productivity.Also, ThunderTask has a iPhone app which sync with the web app allowing its users to work on their tasks from everywhere in the world.